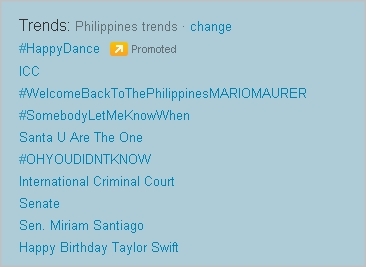 If you notice the terms “Miriam Santiago”, “ICC” and “International Criminal Court” trending on micro-blogging site Twitter, it’s because of the appointment of Senator Miriam Defensor Santiago to the International Criminal Court or ICC. The senator has won a seat in the powerful international body as reported by the Deapartment of Foreign Affairs. ICC is an independent court that tries persons accused of the most serious crimes of international concern like genocide and crimes against humanity. The current selection involved six seats and Sen. Miriam Santiago topped the candidates in terms of numbers of votes garnered. The Department of Foreign Affairs said that in order to be elected, a candidate must receive two-thirds majority of the total number of votes cast. Sen. Miriam Santiago’s appointment is historic as she is the first woman from an Asian developing state to hold the position in the ICC which is based in The Netherlands. In October of this year, Se. 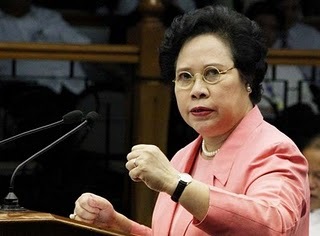 Miriam Santiago was quoted as saying that she would be resigning from the Senate should she win a seat in the ICC. “I’ll have to resign [as senator]. Isn’t that good news for my enemies? I would have to live inThe Hague. I will look like a European and speak like a European and I will be as snooty as a European when I come back”, she said. I wonder if she’ll continue to craft witty pick-up lines while she’s with the ICC. Isn’t that quite witty and funny! This woman could easily construct statements that could either make me burst me burst into laughter or would make me feel like there is something really abnormal about her. Her famous two word quotation which she delivered after her statement that she will jump off the airplane if Joseph Estrada would be convicted made me realize she should not be taken seriously. Her reply to the reporters who asked her why she did not do that when Joseph was convicted was: “I lied!” followed by her loud and crispy laughter.While undoubtedly this woman is in the level of her controversial statements proved she has no control of her own behavior and emotion. I believe it is not all brains that matter in a person. I don’t think one’s excellent mental capacity should be a reason to act as if you are above all things and could utter any word without committing any offense. Miriams Defensor Santiago’s volume and her intonation are attention-getting. Every time she speaks every one would listen because it’s either you get entertained or you get terrified. When she speaks it is as if she is a very principled woman but I doubt if she really is. Her political stand is quite bewildering because it easily changes from being an opposition to pro administration then to opposition again. This goes to show that her mind is unstable and this deprives her of my full trust. Well, Miriam knew all along that her hot-tempered personality is offensive. She in fact in some instances has not been really in bad mood all the time. In fact she sometimes turns into a more approachable person. There are instances she would try to entertain the media reporters with her not so funny joke in her bid to change her image into a more lighthearted and approachable one. Nevertheless, in my own assessment, she is one strange personality and for this reason I could not decide if I would still vote for her this coming election. Miriam Defensor Santiago is to me one of the most interesting figures in the Philippine politics. I admit that I was once so impressed with the eloquence and strong personality of this woman. I believe she also made a very remarkable performance as Commissioner of Immigration and Deportation 1988 and as Secretary of Department of Agrarian Reform from 1989 to 1981. I was so charmed by performance and character and for once she made me proud because I am a woman myself. My admiration for her grew so big that I almost voted for her in the 1992 Philippine National Elections. Well she lost over Fidel Ramos in a controversial election results which she claimed she was cheated and I believed she really was. I did not vote for her because my Christian principle did not allow me but if I were to follow my heart I would have voted for her. But later I did not regret my decision. The true Miriam Defensor Santiago was soon revealed to me as her political career grows longer and longer. This woman is one hot-headed person and that quality I believe would not make her a good leader of one nation. But more than just being hot-tempered I hate to say she has some loose screws as well.